Stand facing away from adjustable shelf, hip to upper thigh height. Grasp support for balance. With assistance from other hand, bend over slightly and place foot on shelf behind hip. Grasp supports with both hands and stand upright. Bend supporting knee slightly while driving hip back closer to heel. Hold stretch. Repeat with opposite side. Do not allow knee to flare outward to side. If low back is sensitive to hyperextension, hip should be postured in more neutral position than demonstrated by positioning shelf lower and bending supporting knee more. 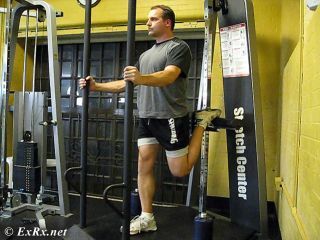 If knee is not completely flexed, Iliopsoas may be stretched; Quadriceps will not be stretched significantly. Tibialis Anterior may also be stretched if only top of forefoot is on shelf, as opposed to top of entire foot.